President urged the European Parliament to speed up the approval of additional autonomous trade preferences for Ukraine. 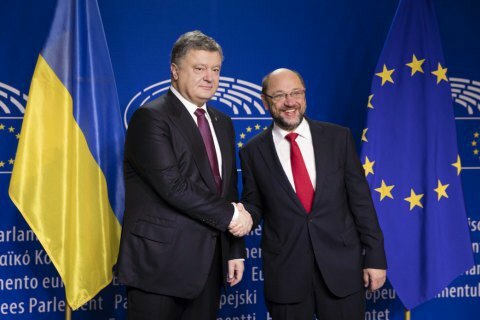 President Petro Poroshenko met with President of the European Parliament Martin Schulz. Poroshenko briefed Schulz on the results of the meeting in the Normandy format held on October 19 in Berlin, presidential website wrote on Thursday, 20 October. The parties discussed the necessity of continuation of sanctions against Russia until full restoration of territorial integrity of Ukraine. They also negotiated the possibility of increasing restrictive measures against Russia in the context of human rights violations in Crimea. President Petro Poroshenko praised constant support from the European Parliament to Ukraine in countering Russian aggression and continuation of reforms. The president urged the European Parliament to provide visa-free regime for Ukrainians as soon as possible. “The European Parliament has a stable majority to introduce visa-free regime with Ukraine,” Martin Schulz noted. The parties agreed that the Association Agreement must be immediately ratified. Petro Poroshenko and Martin Schulz discussed the course of reforms in Ukraine. The President urged the European Parliament to speed up the approval of additional autonomous trade preferences for Ukraine. Meanwhile, the confirmation of visa-free regime between Ukraine and the EU is not on the agenda of the upcoming session of the European Parliament on 24-27 October. On 12 October, Ukraine's Foreign Minister Pavlo Klimkin expressed hope that the EU can resolve its internal disagreements on the development of visa-free regime in the near future and unblock the receipt of visa-free regime for Ukraine and Georgia. Also, the First Vice-President of the European Commission during his meeting with Klimkin in Brussels said that the European Commission fully supports the early introduction of visa-free regime with Ukraine.